Your I Done This account will be equipped with email reminders and digests defaulted to send everyday at 8:30AM and 5:30PM by default and respective to your timezone. When received, the reminder's subject line will contain a standard question of "What did you get done today?, followed by your team's name along with today's date. The date is significant where if you reply to this email with your dones, goals and blockers, those entries will only go to that specific date. So if you're responding to the reminder email that is dated a week back, know that the entries will go to that respective date. The sender will contain the email field of <yourteam>@entry.idonethis.com. 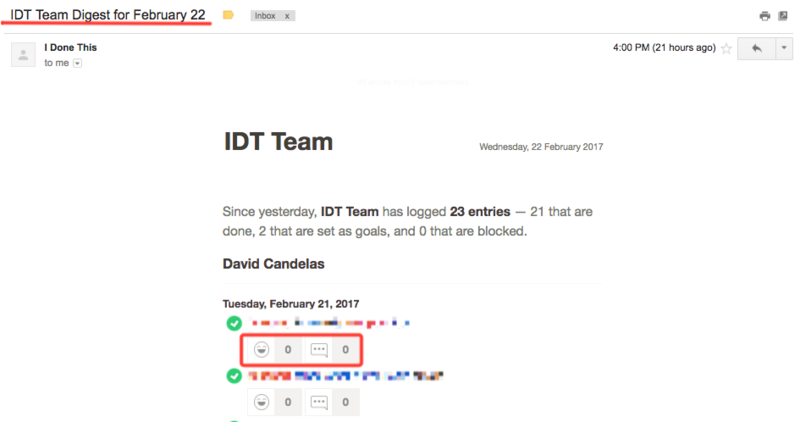 Know that every sent email will differ for each team as well. The digest email is also similar, where the subject line will contain the name of the team and also the date. The date is also significant where you respond to the specific dated email and the entry will go to the described date. The digest email will also hold a summary of the entire's team entries too, giving you a chance to comment and like specific entries from the email itself. 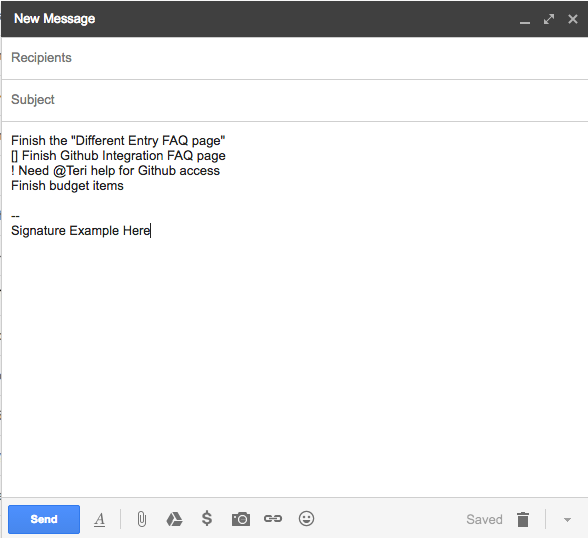 When replying to the either email to log your entries, you can enter multiple entries by hitting the [enter] key. You can also post goals by including closed squared brackets before your entry and blockers by including an exclamation mark before your entry. That's it! If you're looking to change your team's email preferences, you can check out our other article on how to do that here. Feel free to contact us at help@idonethis.com or by calling us at 1(800) 508-9177 for any additional questions you might have.